If you have yet to read the Umbrella series on west coast lighthouses, you're in for a real treat. 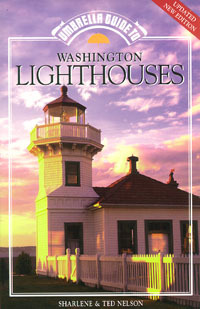 Sharlene and Ted Nelson have written Umbrella Guides to the lighthouses of Washington, Oregon, and California. These concise histories, with much information, have become starts among the numerous lighthouse books of recent years. Their text is factual and interesting, and the sections and chapters on the lighthouses and their keepers are enhanced with photos, map, and visitor information. Though the days of manned lighthouses have drawn to a close, many stations live on adapted to new creative uses which allow them to be enjoyed by the public. These uses are the result of efforts by individuals, private groups, and public agencies to preserve lighthouse history and to make the stations more accessible. 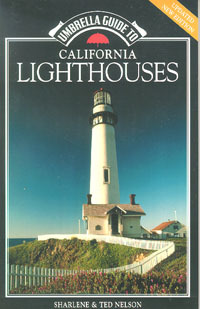 Since the first editions of Umbrella Guide to California Lighthouses was published in 1993, more lighthouse stations have been added to those that can be enjoyed. In this new and updated edition you will find visitor information with directions and tour hours, and learn about the stations that offer overnight lodging and those that are museums. Sharlene and Ted Neslon have been writing about regional history for over forty years. After graduating from the University of California, Berkeley, the couple lived in a northern California logging camp, where Ted was the resident forester. While there, they developed in interest in regional history. Since then, they have lived in North Carolina, Oregon, and Washington. In each place they chronicled local history in articles, travel magazines, and historical society publications. While living along the lower Columbia River, they wrote their first book, Cruising the Columbia and Snake Rivers, published in 1981. 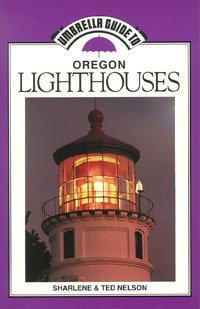 The success of the first edition of Umbrella Guide to Washington Lighthouses led to publication of the related Umbrella Guide to Oregon Lighthouses and Umbrella Guide to California Lighthouses. Their other recent titles include a children's history of logging in the Old West, and children's books about Olympic, Mount Rainier, and Hawaii Volcanos National Parks, and Mount St. Helens National Volcanic Monument, all published by Grolier Publishing Company. Their Epicenter Press book, Umbrella Guide to Exploring the Columbia-Snake River Inland Waterway, was published in 1997. From their Washington home overlooking the Puget Sound, Ted and Sharlene sail, ski, and backpack, often with their grandchildren. Retail discounts are available from Graphic Arts Center Publishing Co.